It is now the fifth consecutive year that Teal, Becker and Chiaramonte, CPAs, P.C. (TBC) has been named a “Top Workplace” by the Times Union, being only one of nine companies to be a five year winner. In order to be considered for the award, employees must nominate their employer and then complete work place satisfaction surveys. The winning companies were announced on Thursday, April 7 at the Glen Sanders Mansion in Schenectady. 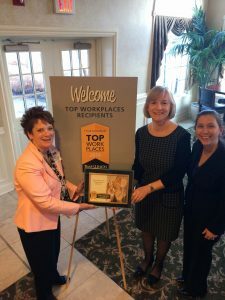 Out of the 25 companies who were awarded a Top Workplace in the small employer category (99 or fewer employees), TBC was ranked in fourth place. “I’m very proud to share the news of this award with our community, TBC professionals are beyond doubt the main reason for this accomplishment. Their dedication and optimism cannot be compared,” said TBC Managing Partner, James Drislane. TBC is located in the Capital of New York State, and has focused on serving local businesses since its formation in 1971. Drislane believes the Firm’s success can be attributed to its knack for recruiting and retaining some of the most talented professionals in the Capital Region. “I relocated to the Capital Region in 2014 and was hired as a staff accountant and have enjoyed working here ever since,” said Grace Finley, CPA, a current employee of TBC. “Everyone, including shareholders, partners, managers and staff have shown great compassion towards the employees and it makes me happy to know that TBC is named a Top Workplace every year,” Finley added. The Times Union began recognizing exceptional Capital Region employers in 2012, and TBC has been on the list since the beginning. This year is TBC’s 45th anniversary, and longtime employees are reflecting on the significant growth the firm has experienced within that time. The Firm now employs almost 90 full time professionals, and the number grows with their seasonal employees as well. The Firm’s 10 shareholders all agree that they can credit much of TBC’s success to the devotion, enthusiasm, and longevity of its employees. To reward the employees, the Firm regularly hosts well deserved employee outings and has exceedingly competitive compensation and benefits. TBC gives employees endless opportunities to further themselves in their industry knowledge through their support for Continuing Professional Education (CPE) courses and conferences, the CPA exam, and other professional designations, both locally and nationally. TBC serves their clients in areas of accounting, auditing, tax, and advisory services. The Firm offers specialty services such as trusts and estates administration, business advisory, valuation, litigation, support services, forensic accounting, and pension services for its clients. The clients are in six primary markets: commercial businesses, governmental, employee benefit plans, labor organizations, not-for-profit organizations, and individuals. Commercial clientele includes construction contractors, distributors, manufacturers, professional service firms, automotive dealers, real estate developers, retailers, technology companies, and wholesalers among other businesses. Thanks for the article. It is very informative. Can you please have your associate mail a paper copy to me. I tried to print, did not work.